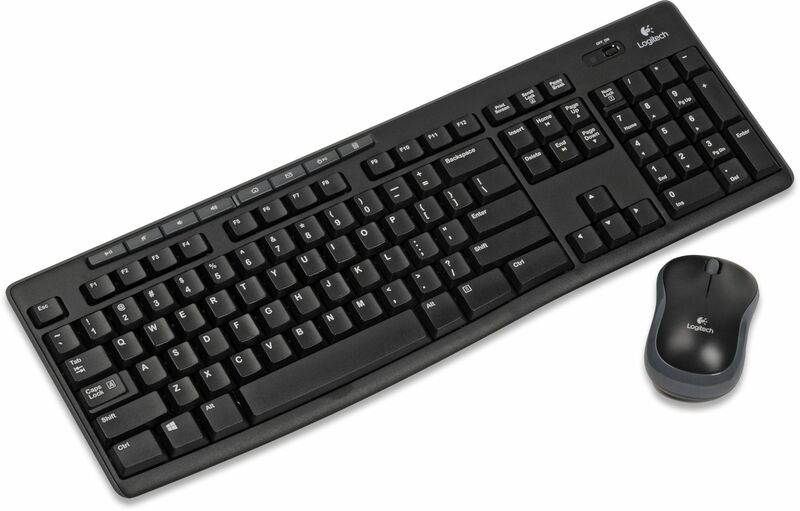 Logitech's MK270 wireless keyboard and mouse set represents excellent value for money. Both devices are both very comfortable to use for extended periods of time and use a USB wireless 2.4 GHz radio transceiver for convenience and reliability. Each device takes AAA-size batteries (supplied) and the mouse uses an optical sensor to track movement across virtually any non-reflective surface. The mouse is comfortable for either hand and its central scroll wheel allows you to move through your documents quickly without having to click on the on-screen scroll bar. The scroll wheel can also be clicked in order to act as a third mouse button. Eight hot keys at the top of the keyboard let you control the most-used media activities including online browsing, playing music and volume control. The keyboard has fold out legs underneath to adjust the angle if necessary to a more comfortable position. The keyboard is also spill resistant.